Drake Controls > News > Product News > Cost Effective. User-Friendly. Introducing the Peak200. Woodward’s Peak200 planned release date for all models, without the INMETRO certification, is March 7, 2017. The planned release date for all models, with the INMETRO (Brazil) certification, is May 2017. The Woodward Peak200 controller is designed to operate small single valve or single valve rack based industrial steam turbines. This cost effective steam turbine controller includes specifically designed algorithms and logic to start, stop, control, and protect small industrial steam turbines or turbo-expanders driving compressors, pumps, or industrial fans. The Peak200 control’s unique PID structure makes it ideal for applications where it is required to control steam plant parameters like turbine speed, turbine load, turbine inlet header pressure, turbine exhaust header pressure, pump flow, or compressor discharge, or suction pressure. The control’s special PID-to-PID logic allows stable control during normal turbine operation and bumpless control mode transfers during plant upsets, minimizing process over or undershoot conditions. The Peak200 controller senses turbine speed via passive speed probes and controls the steam turbine through an actuator connected to the turbine inlet steam valve(s). 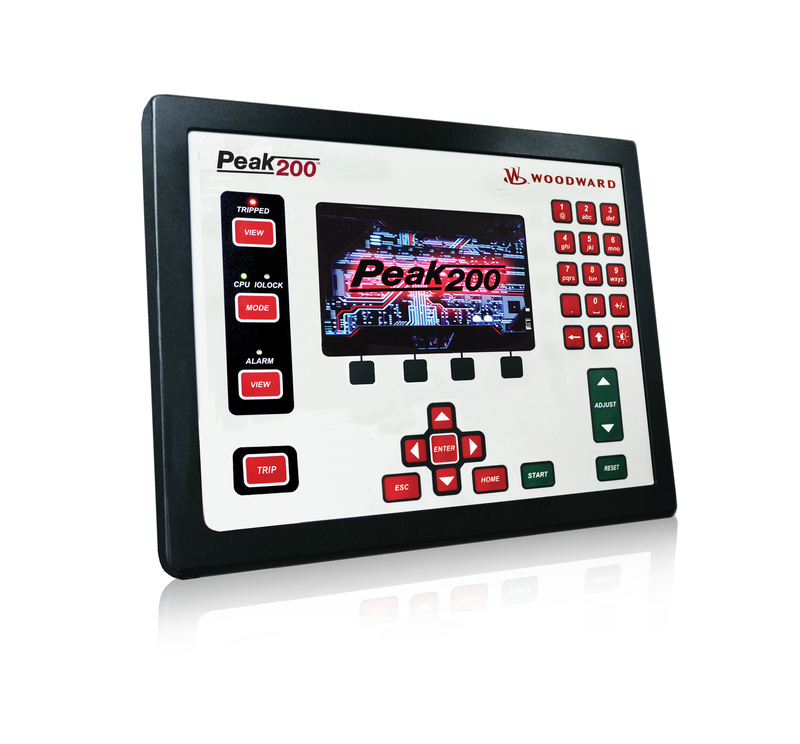 Peak 200 includes Woodward’s patented adaptive PID controller that allows users automatic calculation for optimum dynamic gains at their individual plant system. Designed to function as a plant DCS node the Peak200 controller can be configured to interface with the plant DCS via hardwired inputs/output signals or serial or Ethernet communications. With the capability to monitor and control all turbine and driven equipment based functions (i.e. bearing temperatures, vibration levels, control oil levels, etc.) the Peak200 controller is ideal for use as a cost-effective turbine control/protection as well as plant DCS monitoring node. Alternatively the Peak200 can be configured to accept a remote turbine speed/load demand from the plant DCS via a 4-20mA signal, discrete raise/lower commands, or Ethernet or Serial Modbus communications. The Peak200 control also includes a special “Cascade” PID control function that can be optionally configured and used to control any system process, related to or affected by turbine speed or load. Typically, this controller is configured and used to control turbine inlet header pressure, turbine exhaust header pressure, pump flow, or compressor discharge, or suction pressure. The Cascade PID compares a 4–20 mA process signal with an internal set point to directly position the Speed PID controller’s setpoint, thus changing turbine speed or load until the process signal and set point match. By cascading these two PIDs in this fashion, bumpless transfers can be performed as well as turbine min/max. Ethernet and serial communications allow users to easily connect the Peak200 in to plant or process control system. All controller inputs, outputs, and statuses can be monitored and all start/stop or enable/disable commands can be given through industry standard Modbus TCP or OPC protocols. The Peak200 uses SNTP (synchronized network time protocol) over Ethernet to allow users to synchronize the Peak200’s real-time clock to the plant distributed control system. The Peak200 control is designed to function as the turbine control, system sequencer, operator control panel, and first-out indicator. This encompassing design minimizes external system devices as well as system installation, wiring, and troubleshooting. This field configurable controller allows major functional changes to be made at site, often by knowledgeable plant personnel, and minor functional changes to be online as process changes require. The Peak200 control’s first-out-indicator logic indicates internal as well as external system related alarm and shutdown conditions, greatly simplifying and reducing system troubleshooting. communications using ASCII or RTU Modbus protocols. Communications between the Peak200 and a plant DCS can also be performed through hardwired connections. LinkNet-HT Modules – Optionally users can apply Woodward distributed I/O modules to extend the Peak200 controller’s input and output channels. Vibration Sensor Kit – Optionally users can apply 4-20mA accelerometer sensors with the Peak200 to monitor unit vibration levels and alarm & trip on high vibration events. Refer to product manual for related kit part numbers. RemoteView – Woodward’s RemoteView software program once installed on a computer or touch panel can be used as an engineering workstation and or remote operator control panel. Particulate Pollution Resistance: IEC 60664-1 Pollution Degree 2 (Normally only non-conductive pollution occurs). 3C1 and 3C2, light industrial to urban industrial, heavy traffic). To learn more about the features, specs, and compliance, click here to download the Product Specification.